Wine is a living thing and like all living things, unfortunately, faults can occur. Trichloroanisole, or cork taint, is caused by moulds growing on cork coming into contact with chemicals used in disinfectants. It finds its way into the wine usually through cork, but it can also come from barrels the wine has been made in, or from within the winery. It causes the wine to take on a dank musty and mouldy odour that can be slight or great and smells like wet dog, wet newspaper or cardboard. Oxidisation is the most common wine fault. Like metal, too much oxygen can ruin a wine. It causes the wine to lose its freshness in the glass and on the palate resulting in white wines that become much darker and reds that turn to a brick or brown colour. Oxidised wines can give off aromas that range from dull to cardboard and straw, and all the way to stewed fruits. Commonly referred to as Brett, Brettanomyces is a naturally occurring yeast that when present in wine imparts a distinctive aroma and flavour. 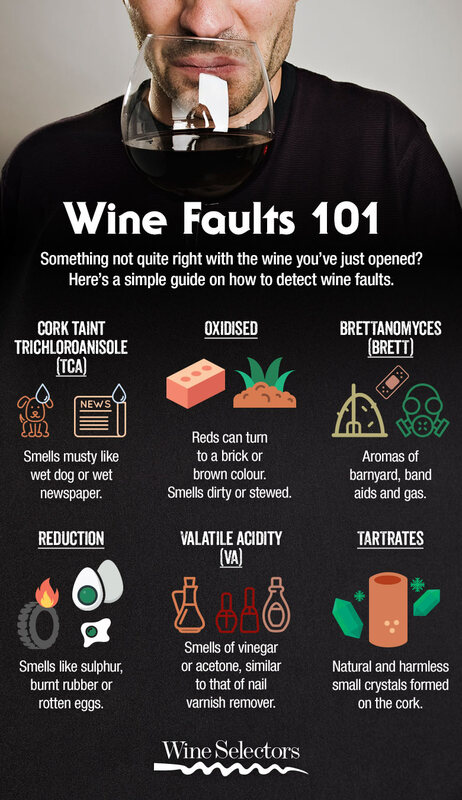 If a wine is affected by Brett it takes on aromas of barnyard, band aids, rotten meat, gas or a burnt smell. It can often be hard to detect and some wines are more susceptible than others. It will shorten the flavour length of the wine and can cause a metallic taste. Reduction in wine is the opposite of oxidisation, meaning that the wine hasn’t had enough oxygen exposure. It can result in a sulphur-like smell, burnt rubber or rotten eggs. Unlike some other faults, reduction can be corrected by simply aerating the wine with the unpleasant aroma ‘blowing off’. Volatile acidity or VA naturally occurs in wine when bacteria creates acetic acid. Wines affected will smell of vinegar or acetone, similar to that of nail varnish remover. Tartrates naturally occur in wine when potassium and tartaric acid combine to form crystals. They are most often detected as clear crystals floating in the wine or stuck to the cork. Tartrates are harmless and won’t affect the aroma, taste or quality of the wine and are easily removed with filtering or decanting. A wine is described as cooked when it has it has been subjected to high temperatures and begins to spoil producing stewed aromas and flavours. The smell of a cooked wine is often likened to over-brewed tea. At Wine Selectors every wine is tasted and assessed by our Tasting Panel which is made up of industry experts – winemakers, wine show judges and wine educators. Each and every wine is put through a stringent tasting process and only wines that receive a Bronze medal score or above (15.5+ out of 20) are selected, meaning only the wines that our Tasting Panel love make it to you. Every bottle comes with a satisfaction guarantee and should you ever detect a fault in any of our wines, please contact our Customer Service Team on 1300 303 307.